Sometimes you want others signature for some business deals these persons are very distance from your place then getting signature is difficult task. Signnow is free web service that will help you to sign or type your signature and then select the font to design your signature. It is very simple and easy to use anybody. It doesn’t require any sign up or download. 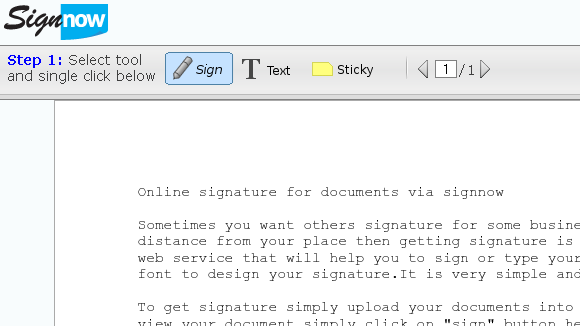 To get signature simply upload your documents into signnow website then you can view your document simply click on “sign” button here you can create signature via mouse or your touch screen and also type your signature, after all process you can sent to other and also invite others to sign documents. This is service very fast you can upload documents in most common formats, signnow suggest PDF format for best view. Signnow delete documents from their server after they are signed. It works every major browser and touchscreen mobile device including iPhone and Android. Electronic signatures are valid and binding in every major country. They give a good message to all save paper, ink and gas by signing online.